GeoBlue Trekker fills health and safety gaps internationally. Insurance- Even if you are already enrolled in a health plan, your coverage is limited when you travel abroad. In fact, your plan may not pay to have you safely evacuated if you are critically ill.
Information- Where do you turn to learn which hospitals and physicians meet your standards? Keep up with breaking news about health and safety threats? Translate key medical terms and brand-name drugs? Access to quality care – How do you find a western-trained. English-speaking doctor with the appropriate skills? How do you arrange a convenient appointment? 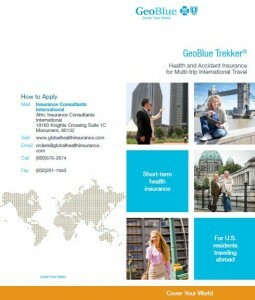 Each GeoBlue Trekker policy includes broad, deep and reliable Global Health and Safety Services easily accessed through the web or the toll-free customer service center. Underwritten by 4 Ever Life International Limited Hamilton Bermuda, rated A- (Excellent) by A.M. Best. 4 Ever Life is an independent licensee of the Blue Cross and Blue Shield Association. Global travelers can leave home feeling confident that a trusted source of care is available at a moment’s notice – no matter what town, country or time zone. Travel anywhere knowing that if your health is a concern, getting good care is not. Initial purchase must be made in home country prior to departing on trip. Dental Care for Relief of Pain 100% of Reasonable Charges, with a maximum of $100 per Trip Period. Available to U.S. residents, age 84 or younger. See Eligibility Requirements above. This is a non renewable plan. Subsequent periods of insurance can be purchased, in which case a new Deductible, and Medical Limit would apply. For more information about the benefits, including information about exclusions, limitations, see the Plan Description. PLEASE NOTE: you can only purchase the policy prior to departing on your trip.